The legendary Toyota Land Cruiser recently celebrated 60 years since it was first launched in Japan. The Land Cruiser has remained constant in the US lineup for more than 50 years. 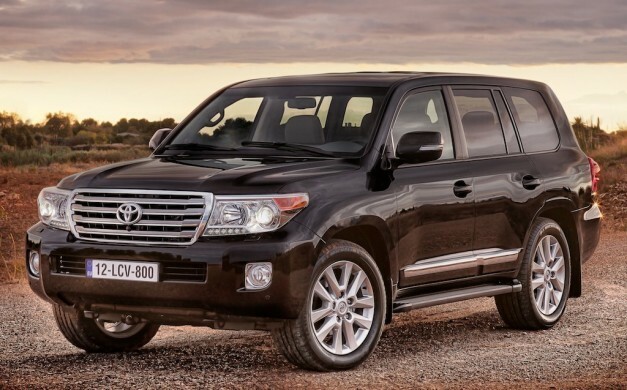 The 2013 Land Cruiser will include the Toyota Entune multimedia system as well as other enhancements. Over time, the Land Cruiser has evolved from a basic four wheel drive utility vehicle to an upscale 8 passenger SUV. The Land Cruiser is sold in more than 188 countries and has remained true to its off-road go anywhere heritage. The 2013 Toyota Land Cruiser received updates on the exterior and interior styling as well as new driving performance features, an array of significant safety features and many convenience upgrades. Rear seat DVD is now standard, as is rain sensing windshield wipers, center console cooler box, headlamp cleaners and more. Most importantly, the 2013 Toyota Land Cruiser will come with the award winning Toyota Entune infotainment system. Toyota’s Premium HDD Navigation system with Entune and JBL speakers will come standard in the Toyota Land Cruiser. The Entune system includes an 80inch touch screen, an integrated backup camera display, and 14 JBL speakers including subwoofer. Toyota Entune infotainment comes with SiriusXM radio capability, HD Radio with iTunes tagging, USB port with iPod connectivity and control, vehicle information, hands free phone capability and phone book access. The Toyota Entune system leverages the smartphone to provide a more complete, richer in vehicle experience. Toyota Entune provides access to navigation and information services. Toyota Entune debuts the Toyota Land Cruiser’s first support for engaging mobile apps. The Entune audio system features an advanced voice recognition system to help keep the driver’s eyes on the road ahead.